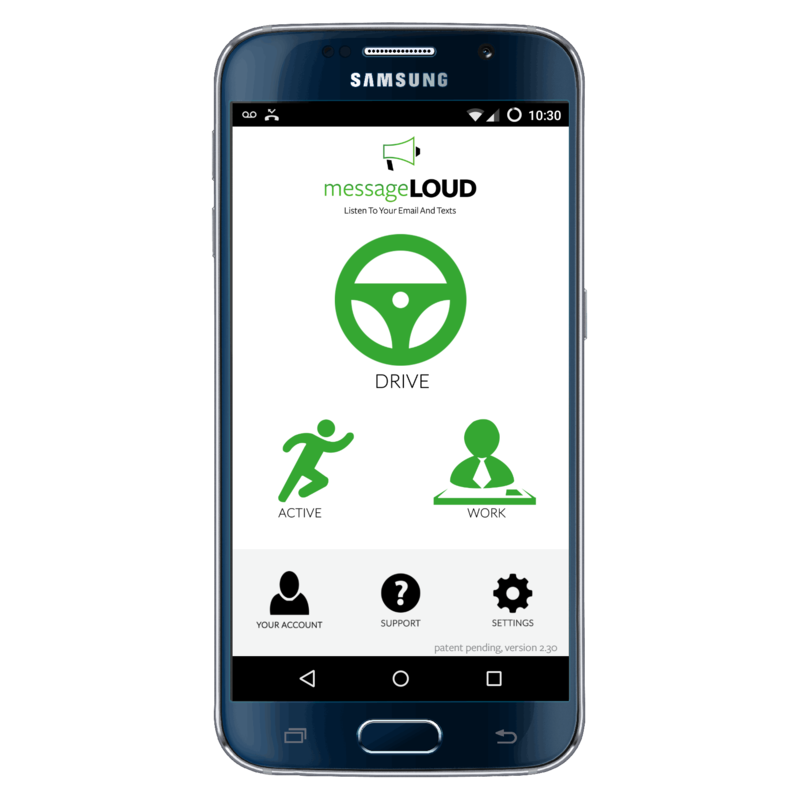 messageLOUD is an app that reads your texts and emails to you in an effort to keep your focus on the road; not on your phone. messageLOUD is very quick and simple to setup. Download it from the Google Play Store, find it on your phone and open it. After opening the app, agree to the Terms and Conditions, click ‘Next’ on the next screen and then click “Continue” on the screen after that. At this point, you will be asked to provide an email address. 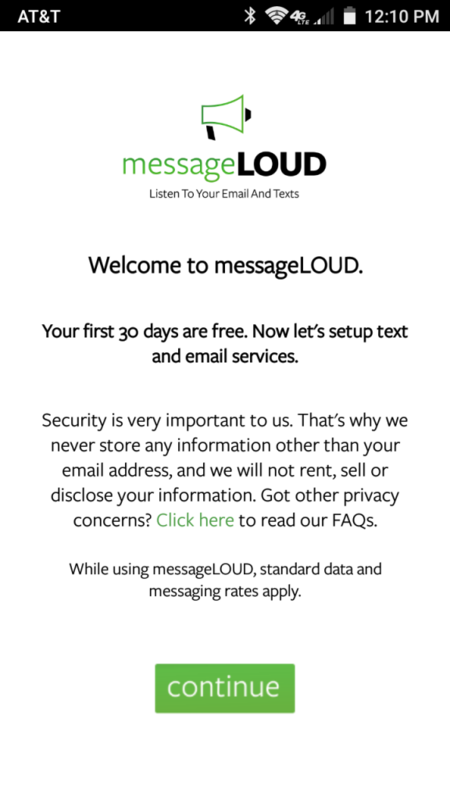 messageLOUD needs this in order to access your inbox so that it can read your emails aloud to you. Click the icon that corresponds to the email service that you use, enter your account details and click “Allow” on the permissions dialogue that appears. After you have done this, you’ll be presented with a screen that suggests you download Google TTS for an optimal experience with messageLOUD. If you need to install this, click the green “Click Here” text and you will be taken to the Play Store download page for Google TTS. If you do not need to install Google TTS, click the black X at the top right corner of the screen and you will then be taken messageLOUD’s main screen. CEO Garin Toren had one goal in mind when he created messageLOUD: put an end to traffic accidents and fatalities caused by distracted driving. Specifically, distracted driving caused by smartphones. 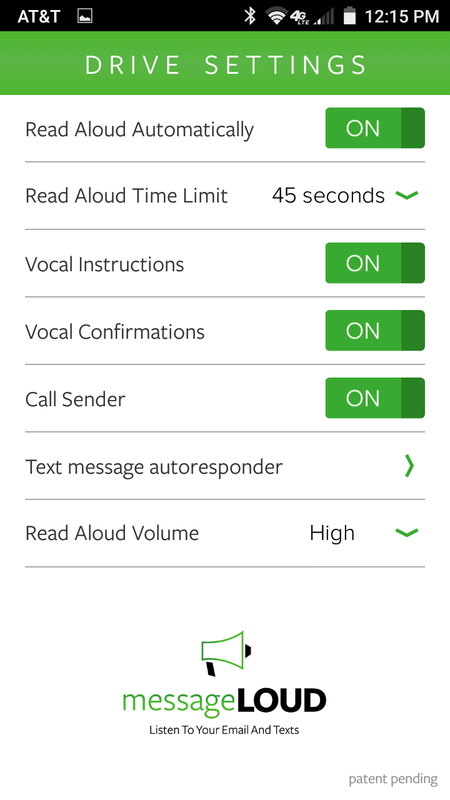 messageLOUD aims to accomplish this by reading aloud all incoming texts and emails that you receive while using the app. messageLOUD also provides single handed gestures you can use to interact with these texts and emails, such as swiping down on your screen to delete an email or text, or swiping up to call the sender of a text message. Each mode is represented by a large, green icon on the app’s main screen. Clicking an icon will take you into that specific mode. There are also icons for Account, Support, and Settings, located at the bottom of the main screen, as well. One nice feature of messageLOUD is the introduction it plays when first clicking on a mode icon. For example, if I click on the Driving Mode icon, the app will being to explain to me how this mode works and functions and it will also display illustrations showing how to perform the gestures this mode has available. You will find similar introductions in each of messageLOUD’s three modes. My personal email inbox gets a lot of junk. I am not always prompt about deleting it, so consequently these emails remain in an unread state. While using messageLOUD, if an email comes in, the app will do its job and read that email to me, but, it will also then proceed to read to me every email in my inbox that is marked ‘unread.’ This can be a bit bothersome if I haven’t gotten around to cleaning my inbox that day. messageLOUD also has a tendency to read every letter and number in an email message. It would be a great improvement if the developers could find a way for messageLOUD to only read an email’s sender and message contents. In this day and age, everyone with a smartphone is used to hearing the voice of Siri, or the voices in apps like Waze, Google Maps, Apple Maps, etc. One thing all of these applications have in common is their in-app voices sound borderline human. Very natural. This is not the case for the voice in messageLOUD. It is very robotic and monotone. This may be off-putting to some users who have grown accustomed to the natural voices heard in the aforementioned apps. Despite this, the voice in messageLOUD does work and it gets the job done. Currently, if you click an icon in the app, you don’t see any sort of visual indicator confirming that you’ve actually clicked the icon. It would be great to see something in messageLOUD akin to Android’s highlighting that appears if you click on an icon on your desktop. It would also be nice to see an in-app back button while in any of the app’s specific modes. Android does offer a natvie ‘Back’ function key, but something just didn’t feel right about messageLOUD not offering it’s own back button that would take you back to the app’s main screen if you pressed it. It almost felt confusing. During my field testing of messageLOUD, I ran into a pretty serious bug. One night, after leaving a store, I placed a phone call to my wife using my car’s Bluetooth. As my call was connecting, an email hit my inbox. messageLOUD, doing its job, began reading this email to me, but it was reading the email over my phone call and consequently, I was unable to hear my wife. I tried deleting the email by swiping down on my phone’s screen, but this did not work. Because I could not hear my wife and because I could not get messageLOUD to stop reading the email, I had to pull into a parking space in order to try and address this issue safely. My next step was closing the app by hitting my phone’s Home button. Unfortunately, this also did not solve the problem. Ultimately, I ended up having to end my phone call, disconnect my phone from the car’s Bluetooth and also kill the messageLOUD app in my phone’s recent apps. Thankfully, I only encountered this bug once. I made sure to tell messageLOUD’s CEO, Garin Toren, about this bug and he assured me that he and his team are aware of it and will address it. messageLOUD is a great concept that has the potential to completely redefine how we interact with our smartphones while driving. In its current state, messageLOUD still needs a lot of work. At times, it can feel a bit clunky and cumbersome; but it works. Keep your eye on this one. You may see something great in its future.